Herstappe, located in the south of Haspengouw is only one square kilometer, two streets, a few houses around the church. No traffic, little parking, little people on the street ... Only peaceful silence, clearly audible. Our authentic farmstead, whose oldest part dates from 1782, has six spacious and well equipped rooms, each with its own entrance, bathroom and toilet. Our breakfast room, which also serves as a multifunctional space, is housed in an annexe with separate entrance. In this annexe are also 3 meeting rooms for 50 people. So you cansay that the Haspenhoeve is situated in the center of the Euroregion! In this unique setting is quiet, walking - and riding pleasure is guaranteed! Organise your meetings and conferences in the smallest village in Belgium, 4 meeting rooms at your disposal, separate parking and catering on request. Also ideal for team building, product launches, baby showers, luncheons, dinners, birthday parties, wine tasting in our wine cellar. 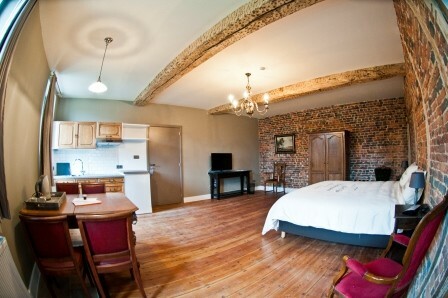 Organize your meeting and conferences in the smallest city of Belgium. 4 Meeting rooms are available, separate parking and catering on request. Also the ideal place for teambuilding, product presentations, babydrinks, lunches, dinners, birthdays and wine tasting in our wine cellar. Bedroom 1 has a view to the unique courtyard from 1782. This room is equipped for the disabled, a possibility for entrance through the courtyard into the chamber. The antique cement tiles are unique and that together with the vaulted ceiling and the furniture of the largest antique market. Room 2 with kitchen also called the former ballroom, is situated on the groundfloor and has nice view on the garden. With his kitchen the ideal place to be for people wanting to stay for a longer period. All the furniture comes from the largest antiques market in the Benelux! Room 4 ,this room has a very nice view at the garden, is equipped with his own coffee and tea cooker.Here you can escape out of your busy life and just relax, sleep and enjoy the nature. Room 5 , situated on the second floor, has a very cosy decoration , done by a Belgian interior decorator. We used the wood of our 15 Canada trees what we had to make the special ceiling. All furniture comes from the Antique Market in Tongeren the largest one of the Benelux. A very nice place to relax. Room 6 has two windows with view on the court. The nice warm wooden ceiling togehter with the well chosen colors and the Antique Furntire makes it a very nice place to be. This room is available with a second bed. 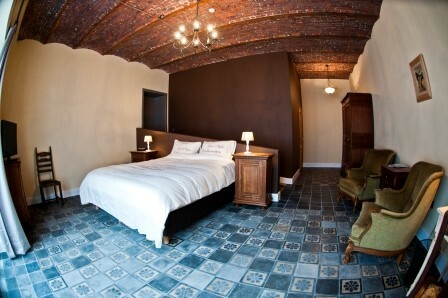 Rooms from 95 untill 110, - € per night breakfast included. Dinner at the Chef, 3-course menu from 35, - € excluding wines, by reservation only. Breakfast from 7:30 to 10:00 during the week and until 10:30 on weekends. Eating at the Chef is a concept for our guests. Based on prime and other local delicacies Limburg are daily specials and menus made​​. For these products we work with regional Pure Limburg. 3 - Course Menu from 35, - €. Bikes for hire on request (free of charge) in collaboration with Tourism Tongeren. Bike Repair Kit spot aanwezig.Afgesloten bicycle. Haspenhoeve also rented Vespas which Ambiorix route can drive (80 km). 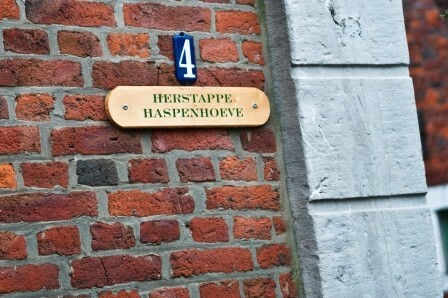 Haspenhoeve offers guests free Internet. Did you stay in Haspenhoeve? Let us know what you thought about it and help others to make the right choice! * I confirm having stayed in Haspenhoeve. 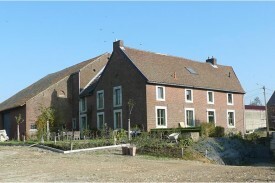 Find other bed & breakfasts in Haspengouw or all bed & breakfasts in Limburg (Belgium).